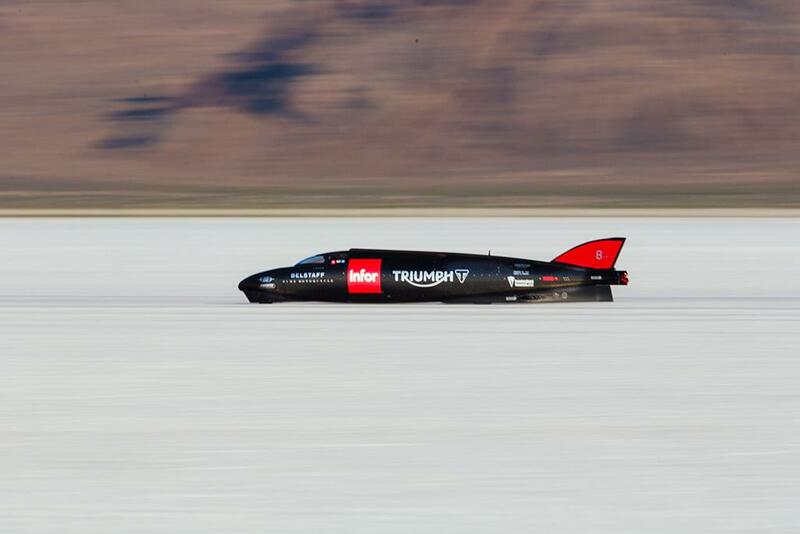 Guy Martin has piloted the Triumph Infor Rocket Streamliner to a new record during practice for the team's world land speed record attempt in late August, by becoming the world’s fastest ever Triumph – achieving a speed of 274.2mph. The previous official Triumph record stood at 245.667mph, while there was also an unofficial Triumph Record of 264mph, both set by Bob Leppan in the Gyronaut X-1. Near perfect conditions contributed to the fast run, which saw the 46 year-old Triumph record consigned to history, and is a solid indication that Guy is getting to grips with the 1000bhp Streamliner – after just five days of piloting the 25ft carbon kevlar behemoth. Each time he has completed another run, he has been able to achieve the goals set by Crew Chief and the Triumph Infor Rocket Streamliner designer Matt Markstaller. “It’s good and we are moving in the right direction, but it is just one step on the way to what me and team are here to do,” said Guy in his usual understated manner. The five-day test is now complete, with the record attempt scheduled to take place in the last week of August, when the team will return to the Bonneville Salt Flats with 400mph on their minds.